This post is filed under Antioch Farms, Chicken, Frozen, Oven. 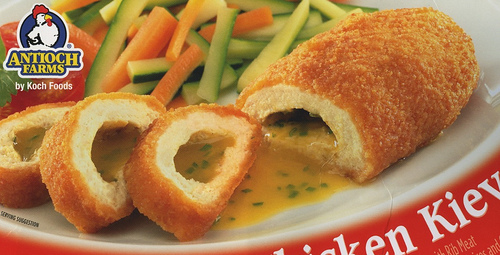 This reminds me that we used to call Chicken Kiev “Exploding Chicken” at my high school. We would have it on special occasions, so it would normally be, “Oh, I hope we’re having Exploding Chicken!” Good times. I wondered about that when I was writing it… I had a feeling I was wrong. I really like this site! 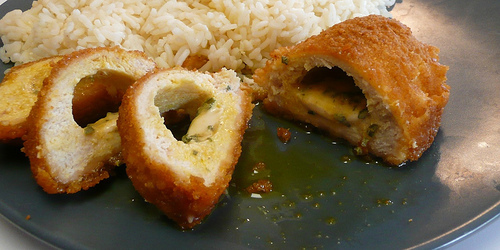 Just fyi, the kiev in Chicken Kiev is a post-positive adjective describing the chicken, so the thing wouldn’t be called a kiev; I’m not sure what it would be called, other than piece of chicken, though. Maybe just a roll or lump or something. I hope this doesn’t make me sound pedantic, because I’m really just nerdy about words and realized I’ve never actually heard anyone refer to those things. Cheers! I was chagrined to find that your Chicken Kiev contains Diacetyl butter flavoring. This is a very toxic compound. I’m surprised you would use something like this. I won’t buy your product again and am going to write Cub Foods about it.